The term "protein arrays" is sometimes used interchangeably with "antibody arrays;" however, they are the not the same thing. 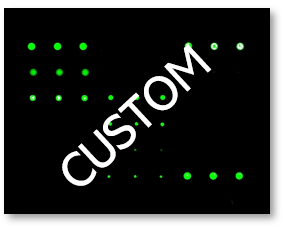 Protein arrays are spotted with immobilized proteins to profile serological (auto)antibodies as well as study protein interactions with other proteins, peptides, DNA, and drugs. Antibody arrays, on the other hand, are spotted with immobilized antibodies, and are used for protein expression profiling. Need help identifying the right array for you? E-mail us at info@raybiotech.com or call us at (888) 494-8555. Click on the "Protein Arrays" or "Antibody Arrays" tiles below to learn more about our offerings.